The Anritsu ME7750A is the low cost 43.5 Gb/s BER test solution, ideal for research, development and manufacturing testing of Gigabit light-wave and digital devices, components and subsystems. The system generates and analyses data streams from 25 Gb/s to 43.5 Gb/s. Also, the ME7750A BERT system can be used to test 40 G-bit transceivers, modulators, MUX/DEMUX, high-speed logic devices, optical module and forward error correction (FEC) rates beyond 40 Gb/s. These capabilities give the users the breadth of applications that thoroughly test and characterise their devices for a complete confidence in their product performance and quality. The ME7750A BERT system consists of the existing popular MP1758A (4-Channel Pulse Pattern Generator), MP1801A (MUX), MP1802A (DEMUX), MP1776A (4-Channel Error Detector) and an external signal source. 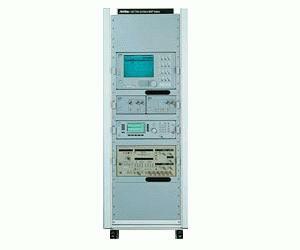 The transmitter side of the output signal is composed of a signal generator (Anritsu'''''''s 69B Series synthesiser) for generating the clock signal, a pulse pattern generator (MP1758A) for generating four channels of 10 Gb/s data patterns, and a 4:1 multiplexer (MP1801A) for multiplexing these signals into a 43.5 Gbit/s signal. The receiver side is composed of a 1:4 demultiplexer (MP1802A) for splitting the 43.5 Gbit/s signal into four channels, and an error detector (MP1776A) for measuring the error rate of the four channels. The phase of each channel is shifted ? cycle which enables multiplexed signal to a pure PRBS stream.